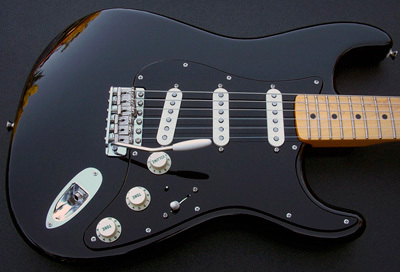 Complete parts listing with a few component options to build yourself a Gilmour style Black Strat® from scratch... Parts cost will be in the range of $1044.48 to $1221.48, your final cost will depend on option selections with the Black Strat® pickguard assembly package and neck selection. Shipping costs and any applicable sales tax will be additional. The complete Black Strat pickguard assembly package includes components such as output jack, 4-1/4" tremolo arm, 19 pickguard, jack plate and back plate mounting screws and a set of GHS Boomers Gilmour signature guitar strings. Any necessary tools required to complete the build such as drill, drill bits, screw drivers, nut driver, soldering iron, solder, nut files, and hex wrenches would need to be purchased separately or you may already own them.